That exports continued to underperform last month despite the effective devaluation of the yen (Link) only makes the Dumas presentation all the more damning. 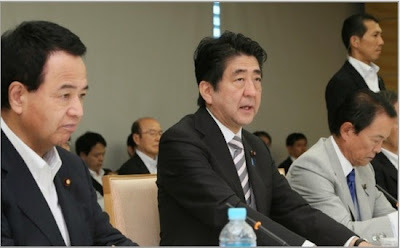 Given that Abe 2.0: The Return of the Princeling was orchestrated by a select group of (often China hating) empire builders of the zaikai who crowd around Abe on the weekends, not letting others with their pesky opinions near their superannuated golden boy, the chances that the PM will be made aware of the changes necessary to save Abenomics, much less implement those changes, are very, very low. Well, the video is a shock! The intelligentsia are losing faith in Abenomics. Darn. I myself have been losing faith in the tooth-fairy, must I now give up on what seems to be a new variety of trickle-down economics? Nah, I know this cannot be true, for I have been observing the US mass media which seems to have pretty much concluded that Abenomics has been a success. Yea, sure, not single one of the executives I know share that view. They sorta think things are going swell at present for companies as far as the balance sheet goes, but think for average families things are gonna be rough. No thoughts of giving anyone much of a raise though, for you see, none of them think they can afford to trust Abenomics. They are not far away reporters and theoretical economists with no skin in the game. Oh, how I wish Abe would kinda give these ol' geezers a goose, for I and many NEED a raise, but I expect about as much out of him now as I do our Dudley-Do-Little, but Squawk-a-lot-Leader. I always get the feeling that somehow the macro-economic theories don't apply to Japan as much compared to the rest of the world. I mean, you have all these professors and economists saying 'no way this is gonna work, give it up already, Shinzo.' but they've been saying that forever. And yeah, it's pretty clear the US and Europe are economically thriving since 2008, leaving Japan in the dust and on its way to become a third-world wasteland. In 1998 they deregulated foreign investment, but that business never really took off for Merill-Lynch and them. Japan's high-rollers would rather blow that cash at the keiba track. Economists said Japan was losing out. Right. How did that work out for Korea again? There's more of these examples but you get the gist. I'm no economist, but I've studied Japan long enough to wonder about this. It's evident Japan's economy is troubled, but there's this saying with a pot and a kettle.